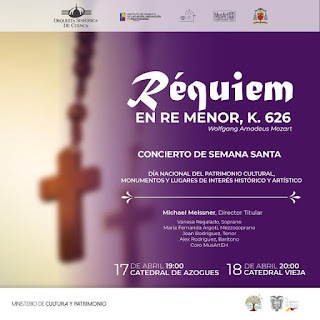 For Holy Week and for the National Day of Cultural Heritage, Monuments and Places of Historical and Artistic Interest, the Cuenca Symphony Orchestra is pleased to present Requiem in D Minor, K. 626 by Wolfgang Amadeus Mozart, conducted by Michael Meissner, Principal Director and with the participation of Vanesa Regalado (Soprano), María Fernanda Argoti (Mezzosoprano), Joan Rodríguez (Tenor), Alex Rodríguez (Baritone) and the MusArtEH Choir this Wednesday, April 17 at 7 PM at the Cathedral of Azogues and Thursday, April 18 at the Old Cathedral at 8 PM. Admission is free until full capacity. Requiem in D minor KV 626. The Requiem (in Latin, "rest"), its name comes from the first words of the "Introit": "Requiem æternam dona eis, Domine, et lux perpetua luceat eis" ("Give them eternal rest Lord, and let perpetual light shine for them). As is known, Mozart fell before finishing his Requiem in D minor, K. 626, his wife Constanze Weber, by express wish of Mozart, sought to finish the work, with the composer Franz Xaver Süssmayr, disciple of Mozart. It is now known that Mozart completely completed the Introito and the Kyrie. The Sequentia was largely composed by Mozart, although it was completed by Süssmayr. The bidder, also started by Mozart, was completed by his student. The two following movements were composed entirely by Süssmayr and the final movement is a repetition of extracts of the Introit and the Kyrie. 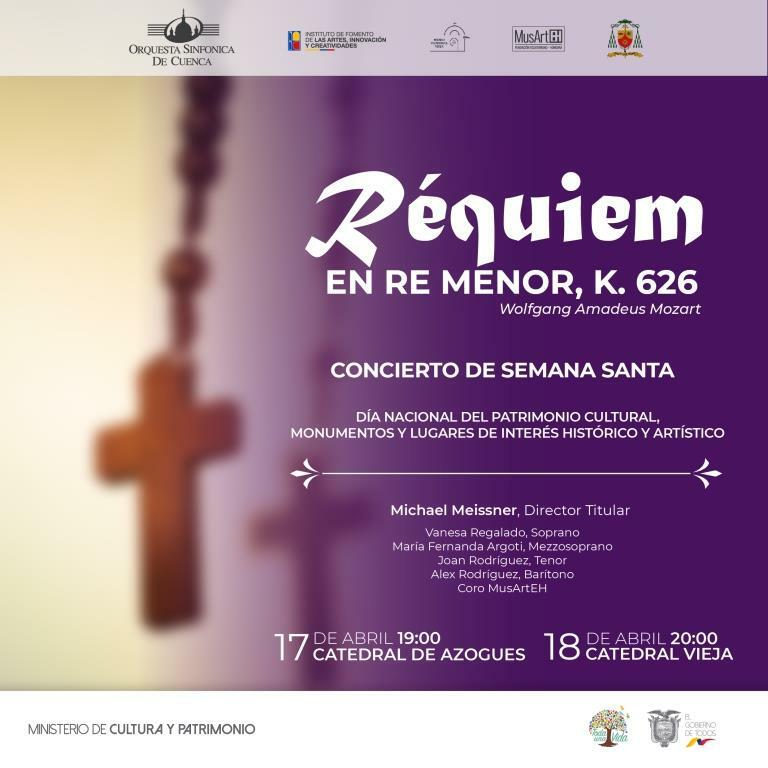 The Mozart Requiem, besides keeping the deepest secrets of how it was inspired, composed and culminated, transports us to a more sensitive farewell to our dead and is a way of feeling Holy Week. The group of soloists and the choir of the MusArtEH Foundation have a passion for symphonic music, a great career, a professionalism, a commitment to lyrical singing and accompaniment. Today from the Cuenca Symphony Orchestra is another great concert for all our wonderful audiences of demanding tastes. Remember that we always start very punctually! We wait for you.